I received an interesting email about an innovative form of advertising yesterday. Hugo Boss has come up with an innovative way to show off their BOSS summers 2013 collection - a short movie (advertorial with a story-line?) called Shanghai Affairs starring Taiwanese model and actress Lin Chiling and Spanish model, Jon Kortajarena. Supposedly, customers can shop products from the collection directly from the movie. At certain points on the movie, text links titled "discover this look" appears. Clicking the link takes you to a page listing the products shown in that particular scene. However, contrary to their promise, you cannot buy the products directly online from the movie. I found out the links take you to their main web page and not to the products. In other words, if you are interested in any of the products, you have to find the the nearest HUGO BOSS outlet and buy it from there or have to search whether the product is available on their online shop. I wonder if this a wonderful plan that was not clearly thought out in the beginning, when they realised that most of their customers prefer to shop at their outlets rather than online. Of course I would have preferred it if the products in the movie had direct links to the product pages on their online store. 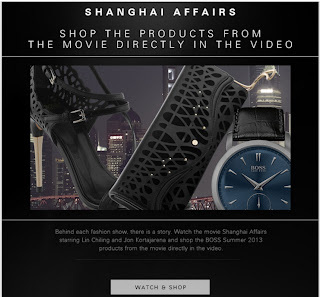 Click here to watch the video Shanghai Affairs.